Well, Gary arrived on Friday morning, and boy, what we didn't know! We'd been playing around with the knobs and valves, but found out that we fully had no water going through the clorinator (gee, is that a problem?) and that when we back wash we were also supposed to be rinsing else it all just goes back into the pool. Umm... oh. Within three days the water is so much cleaner and clearer, it's amazing. Now, we feel like informed pool owners! 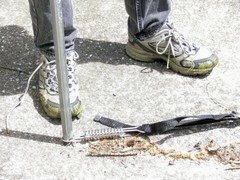 Here are some of our stories of pool maintenance. We are on our third summer. Environmental Test Systems of Elkhart, Ind., is the subject of this article in The Indianapolis Star about a digital reader for pool test strips: "The Aquachek TruTest Digital Test Strip Reader. Consumers no longer have to eyeball test strips and guess whether the chemical levels in their pools are appropriate. With this invention, they simply dip a test strip into the pool or hot tub and then slide the strip into the digital reader. Within 15 seconds, the device transfers the colors on the test strip into a mathematical equation, analyzes the equation, and presents the consumer with a specific number representing the water sample's chemical content in three areas: free chlorine/bromine, pH and total alkalinity." 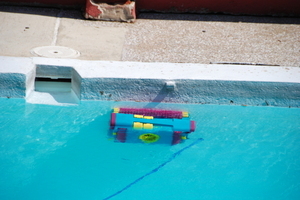 The very special stick makes it easy to release the straps from the screws in the pool deck. One quick flip of the wrist is all it takes. The pool cover is off, and today the pool team arrived to get the pump going.